A thrilling adventure on a beautiful outlet glacier that is suitable for all skill levels. Walk, ice climb and enjoy the magnificent landscape around you on this day tour. On this adventurous glacier walk and ice climbing tour, we take you to a majestic outlet glacier in Vatnajökull National Park. There, you will explore all its features, such as water cauldrons, ridges, and deep crevasses. Your tour kicks off with meeting your certified and experienced glacier guide in Skaftafell. After being fitted with the required glacier gear that we provide, such as a helmet, harness, crampons and an ice axe, you will receive a short safety briefing from your guide. Stepping onto the glacier is like walking into an icy wonderland. Different shades of ice combined with the stunning mountain peaks around you, set the scene for your ice climbing adventure. At the right location, your guide will rig up the climbing ropes. Everyone will have a short and easy introduction to the sport of ice climbing. With only 6 passengers per guide on this tour, each person will have their time to shine. 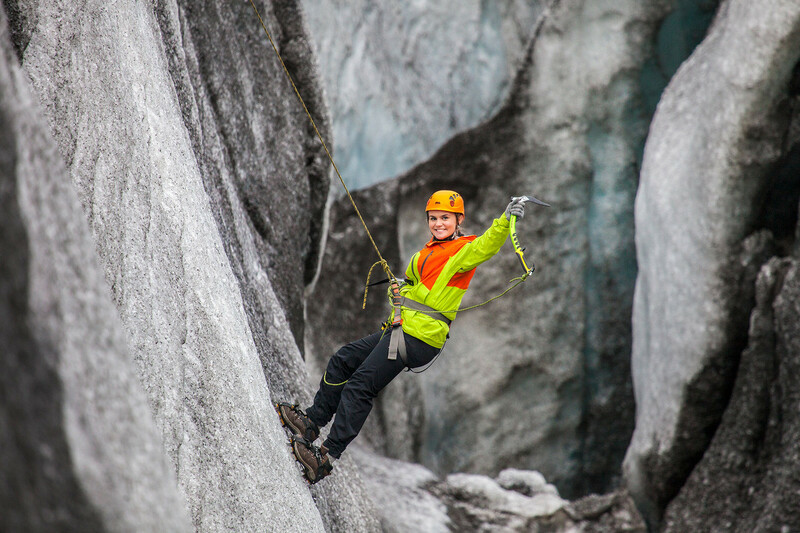 This combination of a glacier walk and ice climbing is a great way to experience Icelandic glaciers. Don't forget to bring your camera!